When it comes to grilling, I always err on the side of safety. Since I grill on my deck I always make sure I move my grill far enough away from the deck railing since I’m always cognizant of any type of fire hazard. 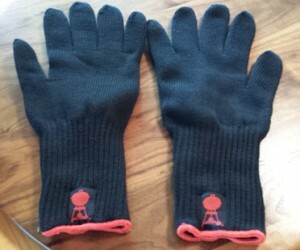 When it comes to hand protection I opted a while back for Weber Grill Gloves. I bought mine about a year ago and have been using them every time I grill. 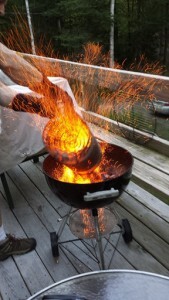 I am particularly aware to always use them when I am about to pour the hot charcoal (images below) from my Weber Rapidfire Chimney Starter that I wrote about in this article. 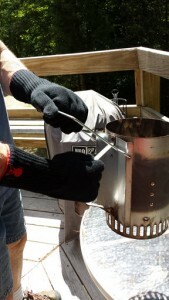 If you have never used a chimney starter this article will give you the step-by-step procedures with images since I got a question asking about how to do so from one of my readers. What I particularly like about these Weber Premium Grill Gloves is that they are gloves! Yes, I am not a fan of the mitts because I really like to be able to use my fingers and I think it is much safer trying to handle anything hot when you have the ability to use your fingers. 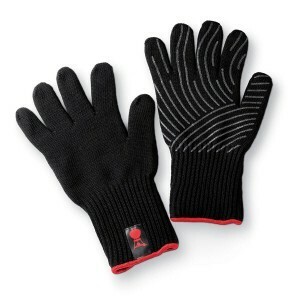 These gloves are so easy to use and keeps the hot away from my hands. Another great aspect of these grill gloves is that they stretch about halfway up my arm for forearm protection and they also have a silicone grip pattern on on the palm which really help for gripping. 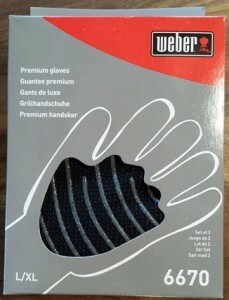 Weber Grill Gloves in box. 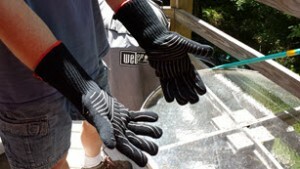 Wearing gloves right before grilling. As you can note from the image above, the gloves come halfway up my forearms protecting me from any contact with sparks, flames, or hot surfaces in this area. The gloves are comfortable and warm when grilling in the winter months. Silicone grip pattern on the palm for a strong grip. 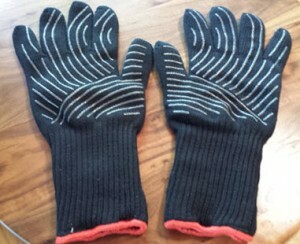 High temperature gloves and warm in colder months. Must-have accessory for charcoal grilling or barbecue.